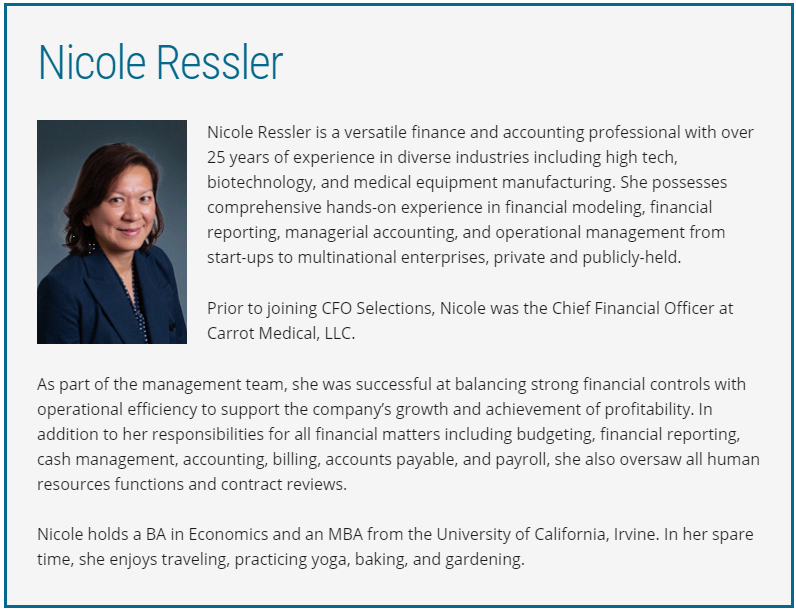 Nicole Ressler is a versatile finance and accounting professional with over 25 years of experience in diverse industries including high tech, biotechnology, and medical equipment manufacturing. She possesses comprehensive hands-on experience in financial modeling, financial reporting, managerial accounting, and operational management from start-ups to multinational enterprises, private and publicly-held. Prior to joining CFO Selections, Nicole was the Chief Financial Officer at Carrot Medical, LLC. As part of the management team, she was successful at balancing strong financial controls with operational efficiency to support the company’s growth and achievement of profitability. In addition to her responsibilities for all financial matters including budgeting, financial reporting, cash management, accounting, billing, accounts payable, and payroll, she also oversaw all human resources functions and contract reviews. Nicole holds a BA in Economics and an MBA from the University of California, Irvine. In her spare time, she enjoys traveling, practicing yoga, baking, and gardening.